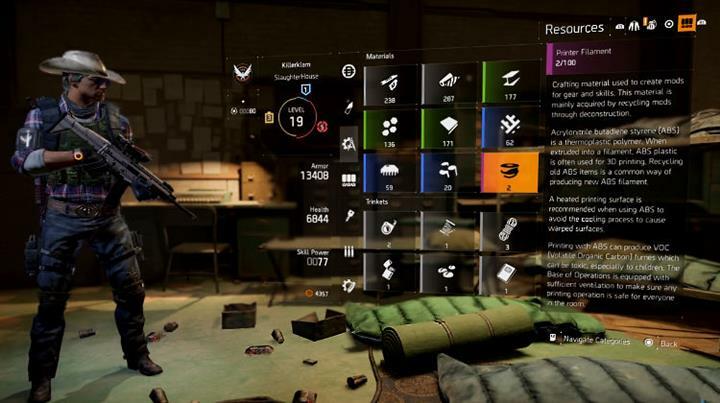 The Division has a range of unlockable character abilities that are split into three sections: Skills, Talents and Perks. For new players these can be slightly confusing and so in this post I'm going to explain the subtle differences between the three and also give you some examples. As you may already know, the game has three character types: Medical, Tech and Security, which roughly translate to Healing, Tank and DPS. Players can choose to switch their character abilities at anytime, making it feel a little like Destiny's subclasses. The three character types directly relate to the "wings" of the Base of Operations. These are like the branches of the overall character tree which players can progress by completing specific quests to unlock new Skills, Talents and Perks. In some cases you'll need to rescue a particular person or recover a particular component. It's all part of the campaign story and most unlocks relate to the story mission surrounding them. Talents: Tactical Advance, Demolition Expert. 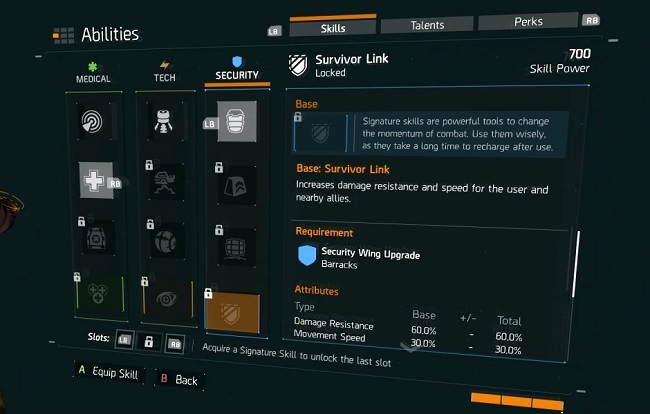 The vanilla version of The Division contains a total of 12 Skills: 4 Skills for each wing (Medical, Tech, Security). You're only allowed to select 3 Skills at a time - 2 must come from normal Skills whilst the other must be a more powerful Signature Skill. Skills are active abilities that the player must trigger themselves when they want to use them. They're assigned to the bumper buttons on console controllers and relate to FPS actions such as throwing a grenade or performing a melee attack. The Signature skill is like the Super from Destiny and is triggered by pressing both bumper buttons simultaneously. Some skills have mods (upgrades) and in fact 9 out of the 12 skills in the game have mods available. For skills that have mods there are 3 normal mods and one master mod per skill. The Master mod is obviously the best mod you can unlock. For each skill, players can only choose 1 of the normal mods and an additional master mod per skill. So for example you can't unlock and activate all of the mods for a particular skill, you need to choose one. This makes sense once you understand what the skills are. This Skill is part of the Medical wing and is unlocked by purchasing the Clinic upgrade early in the game. Using First Aid will heal allies within a small radius but it can also be tactically thrown to heal an out of reach group of friends. The First Aid Skill has three mods and a good example is the Defibrillator mod which in addition to healing downed allies, will also restore a portion of the allies health. This is considered an upgrade and must be unlocked through the Medical wing quest line. The Turret skill comes from the Tech tree and is unlocked early in the game by building the Control Room. 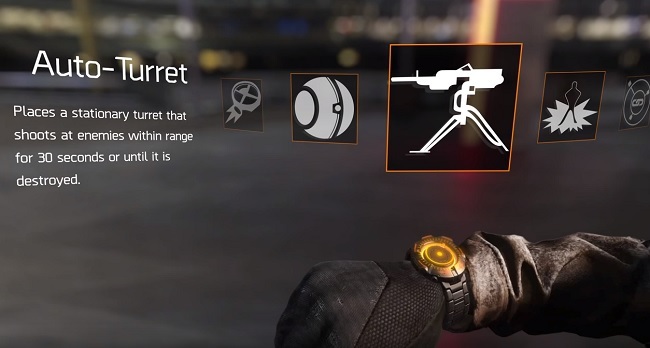 As you can see, the skill is in fact a usable tool or piece of equipment that players deploy, offering sentry style protection against opponents. There are three mods available for the Turret and a good example is the Dragonbreath mod which turns the tower into a flame tower, shooting a column of fire rather than bullets. Talents are like passive mini-bonuses for doing things in the game. A good example is Demolition Expert which is triggered after you kill a hostile with an explosion. The reward or bonus is a 40% increase in explosion radius for 15 seconds. In total there are 24 talents, 8 per wing. At anytime you can only select 4 x Talents and the slots for each Talent are unlocked sequentially i..e slot 1, slot 2, slot 3.. There are 40 perks in the game: 12 x Medical, 13 x Tech: 15 x Security. Like Talents, these Perks grant passive effects but they're usually permanent bonuses. 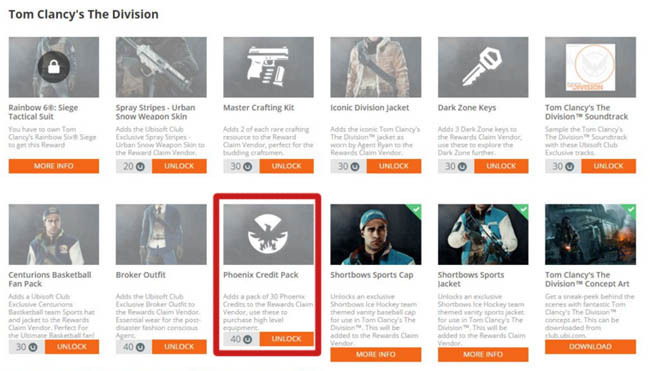 For example the Perk called Hazardous Materials will permanently increase your Dark Zone inventory by 1 slot. Once you unlock a Perk it's yours to keep and you don't have a limit on the number of Perks you can use. It also seems possible to unlock every Perk in the game by climbing to the games highest level (30). This Perk is acquired through the Medical wing and it grants the player a higher virus protection level, letting them access higher contamination areas without the need for a specialized gas mask. Another good example, Resource Assessment is part of the Tech wing and is first unlocked by building SatComms. The actual Perk reveals all Division Tech crafting nodes on the Dark Zone map.